I would like to say just a few words about several of these folks. I enjoyed meeting Debra Dyko, CAGO, at the regional officers' fall retreat when we visited St. Meinrad, where Debra is the recently appointed director of music for the seminary. She comes to this area from California where, among other things, she has worked in church music and composed music published by GIA. Sister Darlene Boyd plays the organ at St. Mary Catholic Church in Evansville and is preparing to take the Service Playing Certificate exam in the spring. Good luck Sister! Diane Edwards lives in Santa Claus, Indiana, attended our November program in Troy and dinner afterwards in Tell City, and expressed excitement at having a chapter event in her neck of the woods. It was good getting to know her. I look forward to getting to know more about these and other new members in the future. One of the things discussed at the regional officers' retreat was the importance of chapter hospitality and welcoming new members and visitors at chapter events. We musicians have to keep reminding ourselves about this because often we tend to be somewhat introverted...it goes along with the nature of our work. It may take some extra effort to talk to people we don't know. Just keep that in mind as we try to make all our meetings and programs warm and welcoming to all. Sunday January 6, 2013: Epiphany Party at the home of our dean, Neal Biggers, on the East Side of Evansville. We will gather beginning at 5:00 p.m. to socialize and share a potluck meal. After the meal we will have a presentation about a major project involving the Tinker Memorial Organ currently located in the Evansville Coliseum, and we will discuss how our chapter might consider supporting this project financially and in other ways. Contact Neal at nealbiggers@yahoo.com or (812) 424-7382 to RSVP and for directions to the house. Saturday March 9, 2013: Pedals, Pipes and Pizza for children will take place at Neu Chapel on the campus of the University of Evansville in the morning. For more information or to register, click here. Friday March 15, 2013: Pedals, Pipes and Tacos, introduction to the organ for adults, at St. Anthony's Catholic Church in Evansville, followed by dinner at Hacienda across the street from St. Anthony's. For more information click here, or contact Carolyn at lcadams_1@juno.com to RSVP or for more information. 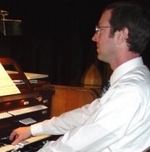 Saturday April 20, 2013: Bach-a-thon at Aldersgate United Methodist Church, Evansville. Get your Bach ready to play! For a pledge form, click here. Our chapter has finalized our contract with William Bolcom's publisher for a major composition for organ and brass, to be premiered by the Canadian Brass and Dr. Douglas Reed on April 19, 2015 at First Presbyterian Church in Evansville. This exciting project is being coordinated by our chapter with the leadership of Robert Nicholls, who is working with a committee to plan community-wide educational and cultural events around the premier of this work and to raise funds for the project. Please contact Robert at robertn@firstpresevansville.com if you have questions or suggestions, or would like to help support this project. Our chapter has been approved to be one of several sites in Indiana and around the country to host the Regional Competition for Young Organists (RCYO). The local portion of the competition will take place at Trinity United Methodist Church in downtown Evansville. This event is for competitors up to 24 years of age. Our chapter's November 2012 program at St. Pius Catholic Church in Troy, Indiana was well received by the forty or so people who attended. The members of the host church were very welcoming and provided a nice reception afterwards. Performers included Rachel Bennett, Neal Biggers, Mai Ishihara, Douglas Reed, Helen Skuggedal Reed, Christian Seitz, and Matthew Vanover. Pieces played were by Buxtehude, Dupre', Pachelbel, Brahms, Vierne, Kaufmann, Greene, Guilmant and Cabena, as well as a couple of hymns. We enjoyed a good meal and conversation at Capers Restaurant in nearby Tell City afterwards. Our Executive Committee will meet Monday, January 7, 2013 at 5:30 at East Side Christian Church. At this meeting we will have more discussion on ways our chapter might support the Tinker Memorial Organ project. As always, all chapter members are welcome to attend meetings of the Executive Committee.